For Krittika births of a masculine valence, the condition of radiant, romantic, intelligent, creative, idealistic, central, confident, gaming, self-reflexive, pitrikaraka Surya may considerably affect the outcome. Instructional guidance provided by emissaries from the civilizations of the Pleyades. Their purpose is confidence-raising and light-bringing in creative pursuit of values fulfillment. Agneya-born gentlemen are often found in politics, in gambling and speculation, or in creative finance.Natural dramatists, Riksya-born are brightly idealistic and self-directed seekers of attention. Mesha pada 1 represents nakshatrapathi Surya's empowerment in romance and celebrity entitlements. In the rashi of Champion Mangala, sparkling Surya asserts radiant genius. Typically pada 1 are dramatists, politicians, royalty, celebrity, creative artists, and unique charismatic figures. Vrishabha-pada-2-3-4 express the tension between two-party bargainer Zukra versus one-party autocratic singular nakshatrapathi Surya. Often the intelligence of pada 2-3-4 is focused into the Values-fulfilling sectors of banking and finance, natural resource conservation, music, wines and perfumes, arts, and beauty. Depending on Yogakaraka Shani ruler of 9+10, the Vrishabha pada of Krittika have a stronger propensity toward government positions. and has the ability to achieve his desires. He has an innate sense of the importance of his destiny . and usually gets what he sets out to obtain ." 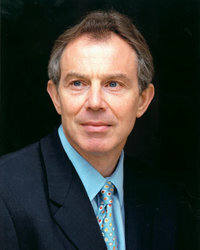 Mr. Leo Blair, the father of UK-PM Tony Blair, was abandoned by his young theatre-actor parents. As an adult, Leo Blair became a working lawyer and university law professor. Surya rules 4-schoolteacher. Initially Leo Blair was a passionate Young Communist, yet he had flipped to super-conservative High Tory by the time his son Tony was ten years old. Ruler of 4 in 12 suggests that while his father had a very strong personality uttama-Surya-yuti-Budha, and dad was a primary parent Surya rules-4, nevertheless the father's full persona remained somewhat invisible to the son. 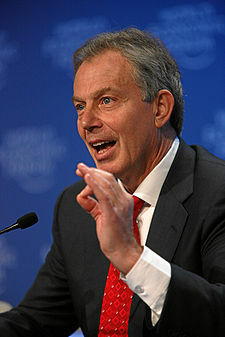 Tony Blair's mother Hazel Corscadden was an Irish citizen, thus Rahu (exotic) + Chandra (mother). Her exotic qualities would have been entirely acceptable and indeed culturally praiseworthy (9, highest beliefs) in goidelic Scotland, but there is enough distinctiveness to grant her the opportunities and boundary-crossing advantages allowed to an outsider. Rahu in bhava-9 * passion for philosophy, preaching * in swabhava of Saptarishi Guru, the Shadowy Specter seeks privilege via glamorous or unusual doctrine, theory, dharma, worldview. Rahu-9 desires a thrilling, important guidance role in catechesis, principled discourses of abstract ideas, ideology, philosophy, indoctrination. Extraordinary father-figure, ambitious professors and holy teachers. Thrives in culturally-mixed preaching environments, university, temple, sangha, congregation. Rahu the Poseur may pose as a charitable philanthropist, a wisdom-purveyor, a proselyte of principled understanding, a guru-figure, a philosopher, or a globalist humanitarian. Rahu-9 trespasses the cultural boundaries of patronage, fatherhood, paradigm of belief. Exciting, opportunistic third marriage (if any). etu in classroom-3 * absentee sibling, off-topic communications, disinterested in daily discourse, dissolved messaging boundaries, disregards conventional discussions, eccentric or esoteric modes of writing, irrelevance of the mental narrative. One abandons the management tasks, dismisses the standard explanations, walks away from the usual descriptions.